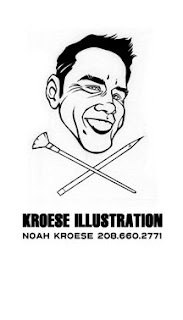 ILLUSTRATION: NOAH KROESE: Yup, still kicking. Sorry for the hiatus in posts. I've been working for the last several weeks on storyboards. They're interesting enough (it's mostly just for practice), but they've taken far longer than I expected and I don't want to post any of them until they're all completed. That will likely be this weekend. To tide you over, here is a business card I designed this week. I love the way it turned out.